Norwegian Cruise Line has no formal dress code. For dinner, collared shirts and pants or "nice" jeans are suggested for men, and slacks or jeans, dresses, skirts, and tops for women. Few issues create as much confusion or contention among cruisers as what to wear to dinner — and, more importantly, what others wear to dinner. As cruises and cruisers have become more diverse, so has dress — both what cruise lines ask us to wear, and what we actually wear. And the more diverse our dress is, the more we argue about it! Just take a look at the dress code-related discussions on our message boards, but be forewarned: anything involving dress codes is likely to have its fair share of vitriol! Just about every cruise line has a dress code of some type. Except for the occasional nudist charter, they all at least agree that clothing is required! But from there on, dress codes range from those where dressing for dinner means putting on a clean T-shirt to those where any male passenger not in a tuxedo might as well be wearing nothing at all. And for every dress code, there are those who try to bend the rules. If a tuxedo is required you'll find those who want to get by with just a suit; if all the cruise line asks is that you don't wear shorts, you can count on someone trying to wear them anyway. Those who follow the dress code to the letter often complain of lax enforcement, and truth be told, many cruise lines do seem loath to turn people away, especially for minor infractions. There are plenty of stories of people in shorts and T-shirts when at least a suit and tie is supposed to be required — but lax enforcement isn't universal; at least on some ships, people do get turned away from the dining room. Once upon a time, it wasn't so complicated. On cruise ships and in first class on ocean liners, formal dress was absolutely required after 6 p.m. — not just in the dining room, but in all the public rooms as well. Until the 1920s, men invariably wore white tie, and ladies evening gowns. The dress code was set for every night of the voyage, and only the truly brazen would dare flout it — and usually wound up being sent to their cabins as a result. Then things gradually became less formal, with black tie slowly making inroads until, in the post-war years, it was the expected dress for men. But with the advent of modern cruising beginning in the 1960s, things began to change radically. New budget cruise lines, whose ships were often second-hand and third-rate, appealed a new type of passenger that didn't own formal dress. Meanwhile, major ships began designating formal and informal evenings. But right into the 1990s, dress codes for the most part remained rigidly defined and enforced, though certainly less so than in the past; there was little confusion or debate about what to wear when. The late 1990s and early 2000s, however, brought a marked change in the dress code scene. As more and more cruise lines turned their focus to first-time cruisers, and as society in general became more casual, big cruise lines began to loosen their dress codes. Many made it apply only to the main dining room — not the other public rooms at night — while NCL, as part of its Freestyle Cruising initiative, was the first to make formal nights "optional." This resulted in jubilation for some and consternation for others — but either way, as different lines tried to find their way in this new landscape, it certainly created a huge increase in the dress codes variation, and placed shipboard staff in the uncomfortable position of having to deal with (or deciding not to deal with) ever more violations from passengers who were confused or just didn't want to comply ("It's my vacation and nobody is going to tell me how to dress!"). The Code: Azamara's dress code is "resort casual"; acceptable attire includes sportswear, golf shirts, shorts, pants, and jacket (if desired, but not required) for men and sportswear, shorts, casual dresses, skirts and pants for women. Number of Formal Nights: The line says "guests should feel comfortable in wearing formal attire if they so desire," but there are no formal nights. Also, no tuxedo rentals are available onboard. Nightly Casual Option: All restaurants are "resort casual," but Windows Cafe, the buffet option allows for an even more relaxed option. Written Restrictions and Jeans: No bare feet, tank tops, caps, bathing suits, or jeans are allowed in the dining room or specialty restaurants. It's in writing. No jeans in the dining room or specialty restaurants, but jeans are OK in the buffet. The Code: Carnival will change its dress code this spring. Currently, most ships have formal and casual dress codes. Formal dress includes tuxedo, suit and tie, or jacket and tie for men and evening gown, cocktail dress or pantsuit for women. Casual wear means sport shirts and slacks for men and dresses, skirts or pantsuits for women. The new dress code is being tested on two ships and will roll out fleetwide in mid-May. Cruise casual dress includes sport slacks, khakis, jeans (no cut-offs), long dress shorts and collared sport shirts for men, and casual dresses, casual skirts or pants and blouses, summer dresses, capri pants, dress shorts and jeans (no cut-offs) for women. Cruise elegant dress means dress slacks, dress shirts and sport coat (suggested not required) for men and cocktail dresses, pantsuits, elegant skirts and blouses for women. On elegant nights, passengers may choose to dress more formally in suits and ties, tuxedos or evening gowns, but this level of dress is not required. Number of Formal Nights: There are two formal nights per seven-night cruise, one on shorter cruises. Cruise elegant nights will replace formal nights under the new system. Nightly Casual Option: For those not wanting to dress up, the Lido restaurants are open nightly and have a casual dress code. Written Restrictions and Jeans: Under the new dress codes, gym shorts, basketball shorts, beach flip-flops, bathing suit attire, cut-off jeans and sleeveless shirts for men are the only items of clothing never permitted in the dining room during dinner. 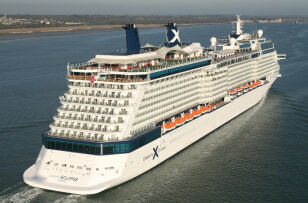 The Code: Celebrity's Web site states that you'll need three types of clothes for a cruise. "Day wear" is comprised of slacks or pants, blouses or shirts, knit tops or polo shirts, swimsuit cover up. "Conservative port wear" is casual, with skirt and blouse, or pants outfit suggested for women and casual pants or walking shorts, and polo-type shirts for men. "Eveningwear" is broken down into three categories: For men "casual nights" includes a sport shirt and slacks, while women will be comfortable in a pants suit, skirt and blouse, or casual dress. On "informal nights," men are requested to wear a jacket, shirt and tie, while women may want to wear a suit or dress. "Formal nights, both men and women may prefer more dressy attire, such as an evening gown for women and a tuxedo or dress suit for men. Number of Formal Nights: The number of "formal," "informal" and "casual" nights depends on the length of your sailing. See Celebrity's dress code chart for details. Nightly Casual Option: Casual dining is offered most nights on every cruise, depending upon the itinerary, and is served in the Palm Springs Grill and pool area on the Mercury and at the Oasis Grill and pool area on the Galaxy. On the Century casual dining is available in the Sky Bar. On our newest ships, casual dining is offered at the Seaside Grill and pool on the Constellation, the Oceanview Grill and pool area on the Infinity, the Ocean Grill on the Millennium and the Waterfall Grill on the Summit. Written Restrictions and Jeans: No jeans on "informal" and "formal" nights are allowed in the dining room. The Code: Most nights are informal, with "resort wear" appropriate; jackets are not required. Number of Formal Nights: There are two formal nights per Caribbean cruise and one or two per European sailings, depending on length. A suit for men and a cocktail dress for women is recommended. Nightly Casual Option: The standard buffet option is available for diners wishing for an even more relaxed vibe. Written Restrictions and Jeans: Though Costa does not reference jeans directly in their written policy, denim is allowed in the dining room, according to a spokesperson. The Code: Cruise & Maritime Voyages has formal, informal and casual dress codes. Formal attire includes a dinner jacket or lounge suit and an evening dress or cocktail dress for women. Informal attire, which applies to most evenings, means a suit or smart jacket for men (tie optional) and cocktail dress, trouser suit or stylish co-ordinates for women. On casual nights, the choice of dress is left entirely to the passenger. 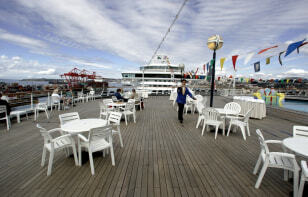 Casual nights usually fall on evenings in port or during special events such as deck parties. Number of Formal Nights: Typically, six- to 15-night cruises have two formal nights, but with longer sailings, the number of formal nights can increase to five. Nightly Casual Option: The buffet restaurant, Marco's, is open from 6 p.m. until 9 p.m. Written Restrictions and Jeans: Shorts and swimsuits may not be worn in the ships' main restaurant. The Code: Crystal has formal, informal and casual dress codes. Formal attire includes a tuxedo, dinner jacket or dark suit and tie for men and an evening dress or gown for women. Informal attire, which applies to most evenings, means a suit or jacket for men (tie optional) and cocktail dress or pantsuit for women. Casual attire includes sport shirts and slacks for men and casual dress or pantsuit for women. Number of Formal Nights: Typically, 10- to 14-night cruises have three formal nights, but with such a wide range of sailings, the number of formal nights can be quite variable (depending on number of sea days, among other things). Nightly Casual Option: The Lido Cafe is only open for breakfast and lunch, and the casual Trident Grill closes each evening at six. Unless they like to dine early, it is possible that guests will have to rely on room service for a truly casual option (and especially on formal night!). Written Restrictions and Jeans: Jeans, shorts, casual slacks, sport shirts and caps or baseball hats are not permitted in the dining room or specialty restaurants after 6 p.m. 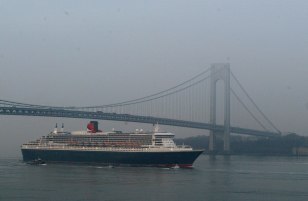 The Code: Cunard has formal, semi-formal and elegant casual dress codes. Formal attire means black tie or formal dark suit for men and evening dress for women. Semi-formal attire includes jacket and tie for men and cocktail dress or pantsuit for women. Elegant casual attire means jacket (no tie required) for men and dress, skirt or trousers for women. The dress code applies throughout the public areas in the evening. Number of Formal Nights: A six-night crossing will typically feature two casual nights, three formal nights and one informal night. Nightly Casual Option: Though Cunard ships generally have a more elegant vibe, each vessel has a more casual option during the evening. Waiter service is added in the evenings to the daytime buffet area. Written Restrictions and Jeans: Shorts and swimsuits may not be worn in the ships' main restaurants. 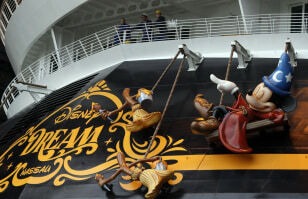 The Code: Disney has formal, semi-formal, "dress-up" and casual nights; "dress-up" applies to three- and four-night cruises and formal and semi-formal to longer cruises. Formal means tuxedo or suit for men and gown or dress for women. Semi-formal means suit or jacket for men and dress or pantsuit for women. “Dress-up” means jacket for men and dress or pantsuit for women. 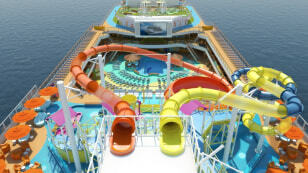 Most cruises include one or more theme nights such as pirate or tropical. The dress code applies to the main dining rooms at dinner. For Palo (specialty restaurant), a dress shirt or jacket for men and dress or pantsuit for women is appropriate regardless of night. Number of Formal Nights: Three- and four-night cruises feature one "dress-up" night, where men are encouraged to wear jackets and women pantsuits or dresses. 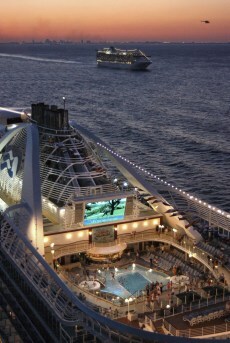 A seven-night cruise features one formal night. Nightly Casual Option: On Disney's family-geared vessels, there is no shortage of casual options. So if little Tina refuses to get dressed up, the laid-back buffet will be there for her. Written Restrictions and Jeans: Casual dress is unspecified, except that shorts, swimwear and tank tops are prohibited in the dining room. The Code: The normal evening dress code requires that men wear a jacket and tie and women are dressed in "informally smart" attire. On formal nights, men wear black tie and cocktail or evening dress for women. The dress code applies to the restaurants at dinner. 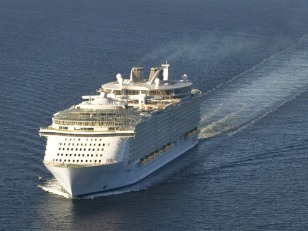 Number of Formal Nights: As a guideline there are usually four formal nights on a two-week cruise. On all Caribbean cruises the dress code is comprised of three formal nights two themed nights nine smart/casual nights. Nightly Casual Option: From a Fred. Olsen spokeswoman: "The informal restaurant is in operation every night, which will give the option of informal dress when the code in the main restaurants is formal. However, 'informal' is proper trousers, not jeans, and shirts with collar. The majority of our guests who will have dressed formally will not be happy if they are then in lounges or bars after dinner in the formal wear, and the party at the next table is dressed in T-shirt and jeans! So the optional code for formal night is informal, not casual. Written Restrictions and Jeans: No swimwear is ever allowed in the dining room. The Code: Holland America has formal and smart casual evenings. Formal dress includes a tuxedo or dark suit and tie for men, and smart casual means sport shirt or sweater and slacks for men and skirt or trousers and blouse or sweater for women. The dress code applies throughout the ship in the evening. Number of Formal Nights: There are approximately two formal nights per week. Nightly Casual Option: The casual buffet option and room service are available for guests not wishing to get dolled up. Written Restrictions and Jeans: T-shirts, swimsuits, tank tops and shorts are not allowed in the restaurants or public areas during the evening hours. Jeans are not expressly mentioned. The Code: "Casual resort wear" is appropriate except for formal evenings where men should wear a suit or jacket and tie, and women a cocktail dress. Number of Formal Nights: There's one on four- to six-night cruises, two on 7- to 11-night cruises, and four on cruises 15 nights or longer. Nightly Casual Option: The standard Lido buffet (and of course room service) will serve guests wishing for a more low-key dining experience. Written Restrictions and Jeans: After 6 p.m., jeans, T-shirts, shorts and bare feet are not permitted in the ships' public areas. The Code: NCL, and sub-brand NCL America, have no formal dress code. For dinner, collared shirts and pants or "nice" jeans are suggested for men, and slacks or jeans, dresses, skirts, and tops for women. Suggested dress applies to dinner in all restaurants. Number of Formal Nights: There are no official formal nights. One restaurant each night is reserved for those who want to "dress up," but no dress code is specified. Nightly Casual Option: It's all casual, save for the one restaurant that's been reserved as a spot for potentially dressing up. Written Restrictions and Jeans: Swimwear is fine at the buffet and outdoor restaurant — so long as you put on a cover-up. The Code: P&O has formal, semi-formal and smart casual nights. Formal attire includes a dinner jacket or tuxedo (or alternatively dark suit or kilt and jacket) for men and a ball gown, trouser suit or cocktail dress for women. Semi-formal attire includes jacket and tie for men and anything from tailored trousers to smart separates or an elegant dress for women. Casual attire includes open-neck or polo shirts and trousers or smart jeans for men and casual separates, dresses or smart jeans for women. Number of Formal Nights: Seven-night cruises average two formal nights; 14-night cruises average four. Nightly Casual Option: If you're not inclined to dress up for formal evening, P&O has you covered with casual dining venues on its ships. Written Restrictions and Jeans: Sportswear is prohibited in the evenings. The Code: Princess has formal and smart casual nights. Formal attire is a tuxedo, dinner jacket or suit for men and evening gown or cocktail dress for women. Smart casual attire includes pants and open-neck shirts for men and skirts/dresses, slacks and sweaters for women. Number of Formal Nights: Three- to six-day cruises have one formal evening; 7- to 13-day cruise two; 14- to 20-day cruises have three; 21- to 28-day cruises have four; cruises of 29 days and more have a minimum of five. Nightly Casual Option: Like the other mainstream lines, guest wishing to avoid the dressy evenings and still eat dinner will have no trouble doing so. Just head to the casual buffet venue on your ship. Written Restrictions and Jeans: In the dining room, items such as cutoff T-shirts, shorts and halter tops are not permitted; shoes must be worn at all times. Jeans were previously part of this list of prohibited items, but they were recently taken off. The Code: The dress code is almost always elegant casual after 6 p.m. Skirts or slacks paired with blouses or sweaters, pant suits or dresses are acceptable for ladies, while men should wear slacks and collared shirts. Sport jackets are optional. On formal optional nights, passengers can either wear elegant casual attire or opt for a more formal look (gowns, cocktail dresses, dark suits or tuxedos). Number of Formal Nights: Voyages of 16 nights or longer have two or more formal optional nights. Shorter cruises are always elegant casual. World Cruise or Grand Voyage passengers should check their cruise documents for specific dress codes. Nightly Casual Option: On Seven Seas Voyager and Seven Seas Mariner, the La Veranda restaurant offers a casual dinner option for guests on formal nights. On Seven Seas Navigator, the Portofino Il Ristorante restaurant offers a casual dinner option for guests on formal nights. Written Restrictions and Jeans: Jeans, T-shirts, baseball caps, shorts, sneakers and bathrobes are not allowed in any public area after 6 p.m. The Code: Royal Caribbean has formal, smart casual and casual nights. Formal attire includes suits and ties or tuxedos for men and cocktail dresses for women. Smart casual attire includes jackets and ties for men and dresses or pantsuits for women. Casual attire includes sport shirts and slacks for men and sundresses or pantsuits for women. Number of Formal Nights: Three-, four- and five-night cruises have one formal night; 6- to 12-night cruises have two formal nights; and 13- and 14-night cruises have three formal nights. Nightly Casual Option: The Windjammer cafe is the laid-back evening choice — though it still has some restrictions: No bare feet are allowed. Tank tops and caps are not allowed during dinner. Written Restrictions and Jeans: No bare feet, caps, tank tops or bathing suits are permitted in the dining room. Shorts are not allowed during dinner. From the keyboard of a Royal Caribbean spokesperson: "As long as the jeans are tasteful with no blemishing, tears or mis-sizing, the guest will more than likely make it through the doors. In this day and age of fashion, there are designer jeans that are very expensive. As a contemporary cruise line, we will not limit our guests on their choice to put their best 'fashion foot' forward as long as it meets our basic standards ... The maitre d', however, does reserve the right to request that an inappropriately dressed guest change their attire before being seated." 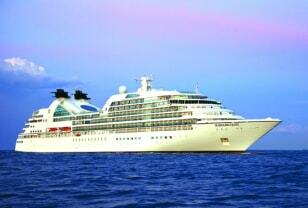 The Code: Seabourn has formal, elegant casual and casual evenings. Formal attire includes a tuxedo (or dark suit) for men and evening gown or other formal attire for women. Elegant casual attire includes slacks with a jacket over a sweater or shirt for men and skirt or slacks with sweater or blouse for women. The dress code applies to the Restaurant after 6 p.m. 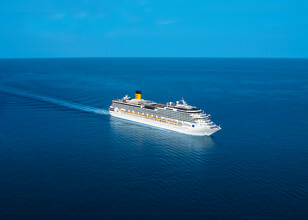 Number of Formal Nights: There are two nights during a one-week cruise and three to four nights, depending on the itinerary, on a two-week cruise. Of course, as Seabourn offers a range of itineraries, dress code depends to an extent on where you're sailing. Nightly Casual Option: The ships' buffet venues, which have incidentally earned high marks for food, transform in the evenings into casual dining options. Written Restrictions and Jeans: There are no written restrictions, but with the elegant atmosphere of the ship, you're unlikely to see too many sloppily clad guests. The Code: Windstar has no formal dress code. For dinner, the line suggests slacks and collared shirts or polos for men and sundresses, slacks and informal cocktail dresses for women. Number of Formal Nights: There are no formal nights. Nightly Casual Option: While there is no requirement to wear a suit and tie, Windstar cruisers tend to dress resort casual. Written Restrictions and Jeans: Shorts, jeans and T-shirts are prohibited in The Restaurant, Degrees (specialty eatery) and the public rooms during the evening. Quiz: What Kind of Cruise Should I Take?